Different couples have different priorities when it comes to the photos. For some it’s the details, for others the couple shots. For many of my couples it’s the guest candids, while most also do appreciate the importance of the family photos. For Niamh and Eamon, what they were most excited about in terms of photos for their wedding day were the night time shots. And their venue – Fota Island Resort in Cork – offers some great options for a night time couple portrait. The night time shots have become something of a trademark of my photography, and while I wouldn’t say I’m booked exclusively for those, it’s true to say that the vast majority of my weddings see me stay until the dancing specifically to allow me capture the evening – including a night time outdoor shot where possible – in my own particular way. So when the time came for me to go and fetch Niamh and Eamon for their trip outside for a few minutes (having already set up lights and scouted two alternative locations) we were all a bit excited! Of course, that’s starting the story of their wedding at the end – it began in Niamh’s bright family home on the northern fringes of Cork city about 12 hours earlier. I can tell within 5 minutes of arriving at a brides house how the day is going to go, and all signs were good when I walked into a room buzzing with enthusiasm for the day ahead in a busy house with Niamh and her bridesmaids Lily, Patrice, Triona and Sarah taking turns with the hair and makeup artists. The ceremony was in nearby St. Joseph’s Church in Mayfield and Fr. McSweeney led us through a beautiful wedding ceremony, as the sun shone outside at the start of what has turned out to be a fantastic Irish summer. I like working at Fota for a couple of reasons – not least because Katie, the wedding coordinator, is very much on the ball and makes contact with the photographer during the early afternoon so she knows exactly when to expect us. She was great in getting us access to the balcony of the golf club for a quick photo in shade before we visited the golf course for a few minutes. (There may have been a chuckle at the expense of a poor golfer who looked on helpless as his golf clubs rolled into the lake over on the 18th green when he turned his back on the golf trolley for a minute). The clock on the golf course is often a favourite with couples, and we used it for a couple of photos before heading to the main hotel for lots of mingling time. I did consider using it later that evening for the night time shots, but in the end opted for the gazebo and bridge at the front of the hotel, along with a west-facing hill that made for a great silhouette. 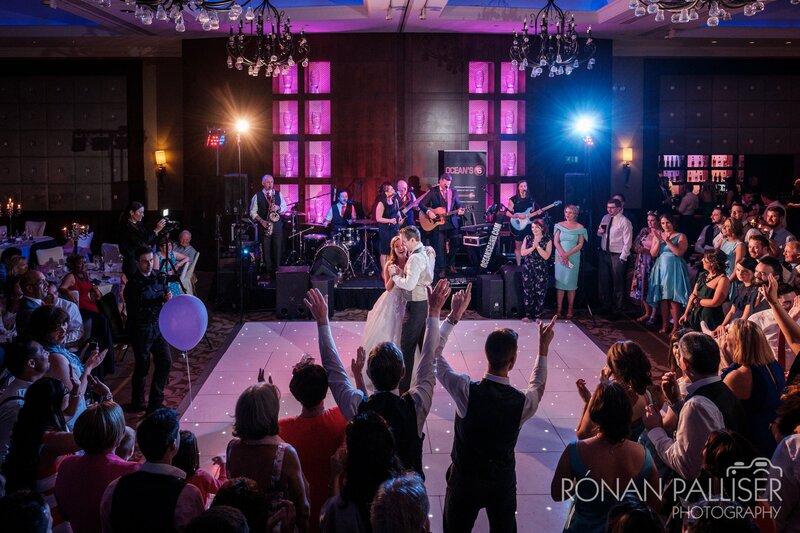 With the night time shots in the bag, all that remained was for the party to start, and Fota reminded me once again of why it has one of my favourite function rooms for dancing shots – colourful, spacious, and a great space for a party. And it was indeed a party, and one well underway at that, as I departed for a quick visit to my parents-in-law and some sleep before making the return trip home, excited to get a closer look at the photos from a great day. Take a look!